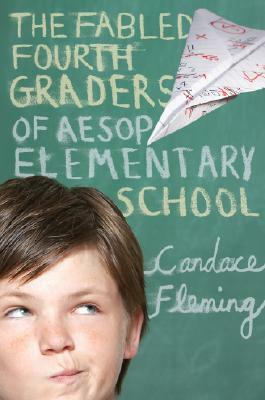 The Fabled Fourth Graders of Aesop Elementary School by Candace Fleming. (Grades 3-5.) Schwartz & Wade, 2007. 186 pages. Review copy provided by my local library. The fourth graders at Aesop Elementary School are... precocious? Robust? High-energy? Well, let's face it: they're trouble-makers and their reputation has preceded them. In fact, the principal doesn't know what to do because she can't find a teacher who will take them on for the fourth grade! Enter Mr. Jupiter. He claims he's conducted the Timbuktu Philharmonic Orchestra, discovered the lost city of Atlantis, and taught hula dancing at the Balderdash Academy for Boys in London. He also claims he can handle the fourth graders at Aesop Elementary School. But can he? At first, I didn't know what I was getting into with these wacky, silly stories of wacky, silly fourth graders. And then I realized that each story is a modern retelling of an Aesop fable (complete with moral at the end). This is a really clever way to introduce Aesop's fables and I can definitely see classroom applications for this book! Pair this book with a collection of Aesop's fables and ask students to compare fables with the same moral and then write their own. The wacky humor definitely has high kid-appeal and I'd hand this to fans of Sideways Stories from Wayside School by Louis Sachar. That's what I kept thinking of as I was reading it. Similarly to Wayside School, each chapter features a different student and they're filled with silly humor. Read another review at Becky's Book Reviews. The Fabled Fourth Graders of Aesop Elementary School is on shelves now! Also available: The Fabled Fifth Graders of Aesop Elementary School!